At 22-years old and working on a master's degree in sports biomechanics, I knew everything about abs. I knew the planes of movement. I knew functional anatomy. And as a lifelong athlete and strength enthusiast, I could pair the right exercise for the target area. I had intelligent core training down cold. As it turned out, I didn't even know what I didn't know. My thinking and education led me to believe that if our core and lumbar spine could move, we should move it. Now, I know better. I know that what's most important is training the core and lumbar spine to be stable - to resist motion rather than create it! Which means you may never do another crunch once you finish this article. What you don't learn about are stabilizers like the diaphragm, pelvic floor, multifidi, etc., or why they're important. Instead, the basis of the lecture (and the magazines) revolved around the showy 6-pack-type muscles -- or at the very least, the ones we could train in the gym! Now, 12 years later, I would describe the core differently -- as a box with 6 sides. On the top is your diaphragm. On the bottom is your pelvic floor. In the front are your rectus and transverse abdominus. In the back are your multifidus and spinal erectors. Last but not least, on the sides are your internal and external obliques, along with your quadratus lumborum. The thing about defining the core is that it gets tricky fast. I could argue that just about any muscle from your neck down could play a role in core stability. But for today's purposes, we're going to focus on these basic muscles and their respective functions. As I started learning more and more functional anatomy (and learning from people far smarter than myself), I started to put the pieces together. I learned that the lumbar spine (i.e. lower back) isn't built for rotation. In fact, you only have 0-2 degrees of rotation at each segment of your lumbar spine! Even top to bottom, you only have about 15 degrees of rotation through your lumbar spine. I know a handful of you are going to be clamoring for references here. I'd suggest picking up books by Shirley Sahrmann, Stuart McGill, or Nikolai Bogduk if you want "proof." Upon leaving my master's program I worked in a chiropractic rehab facility where I dealt with crowds of lower-back pain patients. As a result, I read the works of the aforementioned McGill, the foremost spinal biomechanist in the world. He focuses on trying to minimize repetitive flexion and extension through the lumbar spine; this is the exact pattern that produces disc herniations! I know what you're wondering: What does all of this have to do with me and the 6-pack I don't yet have, but desperately want? What it means is that it's time to stop the sit-ups and crunches and find exercises that develop the core while maintaining the health of our lower backs! Let's break down each component and give you practical examples for the next time you're in the gym! Anti-flexion is probably the easiest component of core training to understand. Every time you squat or deadlift, you are essentially training anti-flexion! The goal of anti-flexion exercises is to resist flexion, or bending, through the lumbar spine. While you can get plenty of development from big-bang exercises like squats and deads, more isolative exercises like back extensions or reverse hypers can also help. The key when performing these movements, however, is to keep your low back neutral and squeeze your glutes at the midpoint of the movement. The goal of anti-extension exercises is to resist extension through the lumbar spine. But anti-extension is one of, if not the most, poorly-executed elements of core training. Most would benefit from properly executing basic exercises such as front planks and push-ups, while using a PVC pipe to get into a neutral alignment. Over time, you can progress to more challenging variations like ball or ab wheel rollouts, or even unstable progressions such as blast strap and TRX fallouts, flutters, and Miyagis, etc. The key here is simple: You must keep the spine in neutral, and not allow your lumbar spine to hyperextend! I used to love dumbbell side bends back in the day. This was one of those exercises you could just feel for days after your workout. It really felt like you were getting some work accomplished! But the goal of anti-lateral flexion actually is to resist lateral flexion, or side bending, through the lumbar spine. So if we ditch the side bends, what do we replace them with? We can take the same principles, but tweak them for a great training effect. 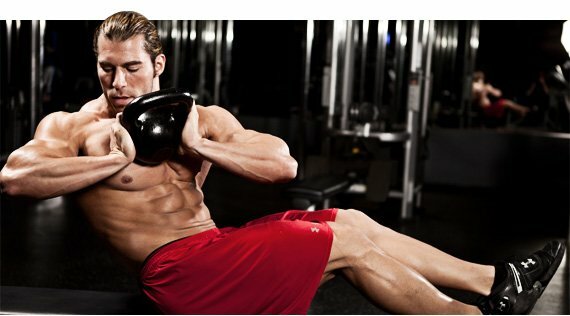 Instead of side bending, hold a dumbbell in one hand for an extended period of time without allowing side bending. If that's too easy, progress to an offset farmer's walk or waiter's carry, holding the weight in one hand while extended overhead. If you're a true soldier, consider suitcase deadlifts. Remember, a lot of these moves may shock to your system! The goal isn't to load the weights up and stumble around like a drunken sailor in a typhoon. Lock your spine into place and don't let it move! This was the hardest component of core training to give up. I really loved doing rotational med ball work. Now, I do anti-rotation work instead. The goal is to resist rotation through the core and lumbar spine. My favorite exercises for training the anti-rotation component of the core are Pallof Press variations. At IFAST we do them in tall-kneeling, half-kneeling, standing-up, and even standing combined with a side step. The key here is to lock the core down and not allow any rotation through the core and lumbar spine. You'll be surprised at how difficult these are! Last but definitely not least, we have hip flexion with a neutral spine. One of the most challenging components of lifting is getting set-up in the starting position of a deadlift, or squatting as deep as possible, without rounding the lower back. This exercise sequence will help you get there. The goal of this progression is to keep your core and low back in a neutral position, while simultaneously flexing your hips. Exercise examples here would include prone jackknifes on a ball, band resisted jackknifes, alternating band-resisted jackknifes, and even hanging leg raises. The key is keeping the low back neutral and moving only through the hips! Your Most Pressing Question Answered! Once again, I know what you're thinking: "But Mike - how can I get a 6-pack from these exercises?" I hope you already know that getting a 6-pack is dictated far more by your nutrition and overall training program than it is by your selection of core exercises. But I can also tell you this: If you dial-in the exercise and nutrition component, even when using only core stability exercises like the ones I've outlined above, you can absolutely get ripped up. Just check out the two ladies I trained below for proof! So you're sold on swapping out the crunches, sit-ups and side bends for core stability work. Good for you! If you want to build it into a program, I think the best way to train the core is via small doses throughout the week. No need for an all out core-blasting session; breaking it up into bite-sized chunks works and feels better. Unless someone has a specific lower back weakness, it's rare that I program isolated anti-flexion work into the program. Chances are if you're doing enough of the big lifts, your lower back strength is more than up to snuff. So there you have it! A more sophisticated approach to core training that will help you look amazing and keep your back healthy! I know I'm asking a lot of you here, but give these exercises a shot, even if it's only for a month or two. I think you'll be surprised not only by how challenging they are, but how much better your body feels as a result!